Houstonians celebrated the feast of Our Lady of Guadalupe Wednesday with shrines, music, flowers and candles. HOUSTON- People all across Houston, and really the world, are honoring the Lady of Guadalupe. Catholics consider December 12 as the birthday of the patron saint of Mexico. Celebrations in Houston started at midnight, with a mass offered for the saint's feast day. Photos, videos and posts honoring the Lady of Guadalupe were trending topics across social media. On December 12, we celebrate Our Lady of Guadalupe, patroness of the Americas. We ask her intercession for the protection of all life. 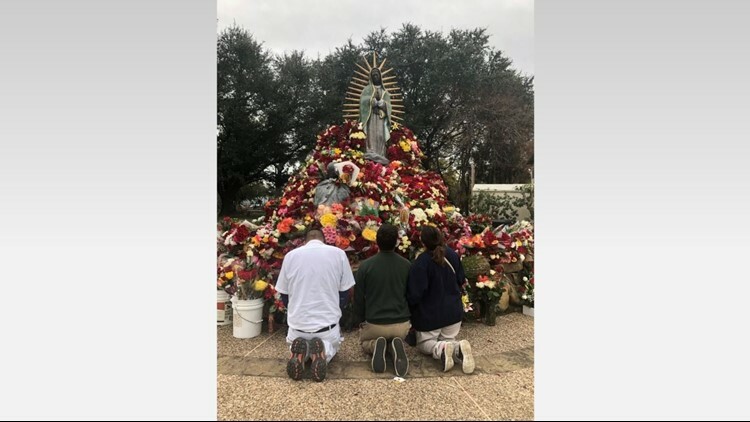 One of the biggest celebrations happened at the Our Lady of Guadalupe Catholic Church at 2405 Navigation Boulevard in east downtown Houston. An alter, that features the Mexican rendition of a darker-skinned Virgin Mary is covered with fresh roses. Hundreds and hundreds of candles with the image of the Lady of Guadalupe burn at the foot of the alter. The candles represent prayer intentions. The annual celebration includes expressive prayer dances, food and music. It is meant to connect a community that's grateful for the mercy of the Lady of Guadalupe. "A tradition and it’s a big blessing for us," said Diana Lopez. She is one of four generations of Lopez women who brought bouquets of roses as gratitude for another year of blessings. "She listens. So we have faith in her," said Cynthia Lopez. "I’m actually lighting my candles to petition for someone that has cancer," said Shery Ortiz as she juggled multiple unlit candles and a trio of flower bouquets. "It’s just something special," said Ortiz. "That we have this one day that we actually can all come out at the same time and honor."